In a year when the world is awash with adaptations and celebrations of Charles Dickens’ work, a revival of Lionel Bart’s musical version of Oliver Twist could be considered Dickensian overkill. Does the public need another depiction of the great writer’s Victorian underworld during the 200th anniversary of his birth? After seeing Cameron Mackintosh’s touring production of Bart’s masterpiece at the Palace Theatre in Manchester, the answer must be yes, yes and thrice yes. The combination of Mackintosh’s exquisitely presented show, Bart’s energetic score, Matthew Bourne’s rambunctious choreography and an ensemble performance of the finest quality served as a timely reminder that Oliver! deserves its place in the highest echelons of musical theatre. From the moment the curtain rose to reveal the grey interior of a Midlands workhouse to the second it fell on the silhouette of Fagin trudging down the grimy streets of London, Oliver! sallied along at a suitably jaunty pace with the wind in its sails. If only all musicals were this perfect. Admittedly, Bart had some wonderful material to work with. The story is of an orphan boy taken in by a gang of colourful young vagabonds, led by a raggedy con merchant who teaches them they’ve “got to pick a pocket or two”. Throw in a villainous character by the name of Bill Sikes, a prostitute with a heart of gold and a long-lost family connection and you have all the ingredients for a rollicking good tale. Thankfully the cast were up to the job. 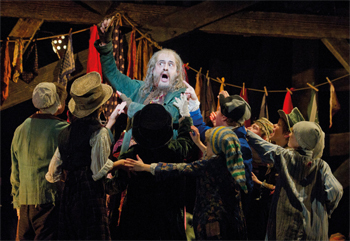 Neil Morrissey provided the small screen glamour in his role of Fagin, drawn by Bart (in contrast to Dickens’ rather darker portrayal) as a miserly old man who nonetheless inspires affection from his coterie of young thieves and audience members alike. Morrissey’s television career was alluded to with references to ‘Bob the Builder’, and doubtless some of the females in the auditorium harboured a soft spot for him in spite of the balding pate and scruffy beard. The roles of Oliver and the Artful Dodger were winningly played by Harry Polden and Max Greisbach as were the parts of the undertakers, Mr and Mrs Sowerberry. Just as the diabolical Thenardiers in Les Miserables are difficult to dislike, so CJ Johnson and David Langham proved that a blistering performance can inspire a large round of applause. Iain Fletcher did the job as the despicable Bill Sikes but, for this critic at least, any actor in that role will inevitably come second to Oliver Reed who produced a never-bettered performance as the violent thug in Carol Reed’s Oscar-laden 1968 film. 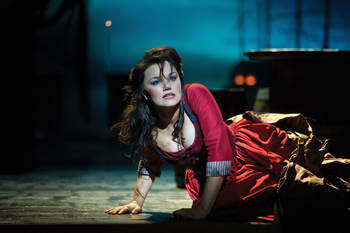 While Morrissey et al delighted the sell-out crowd at the Palace Theatre, Samantha Barks as Nancy was, without a shadow of a doubt, the stand-out artist of the night. From her joyful and vivacious turn as the lead voice in ‘Oom-Pah-Pah’ to her harrowing delivery of ‘As Long As He Needs Me’, the actress who was a runner-up in on the BBC talent show ‘I’d Do Anything’ in 2008 was, to put it bluntly, bluddy brilliant. No wonder that earlier this week Mackintosh interrupted her curtain call to announce she is to play Eponine in the film adaptation of Les Miserables. 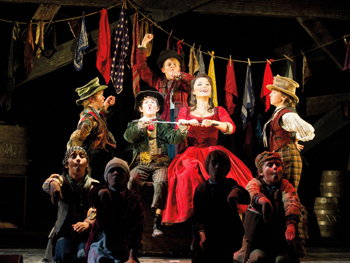 But the actors aren’t the only stars of Oliver! The quality of the sets and the lighting put other touring productions to shame. Indeed, the backdrops for St Paul’s Cathedral and Mr Brownlow’s exclusive Bloomsbury address exhaled a rare kind of decorative purity that is seldom seen on stage. Possibly this contributed to the musical’s overall lightness of touch – the film is much more sinister and, let’s face it, there is a brutal murder near the end in all versions – but somehow that didn’t seem to matter. Oliver! is touring throughout 2012, although it may now lose its star Nancy. Nevertheless, you should do anything to see it. Oliver! is at the Palace Theatre, Manchester until March 10th 2012. Presented by Cameron Mackintosh, Southbrook Group and Stage Entertainment UK. The staff at the Palace declare they 'would do anything' to promote Oliver!